It may be the smallest model of the 2018 Ford model lineup, but the new Ford Fiesta at Akins Ford near Atlanta, GA, is still a whole lot of fun to drive. 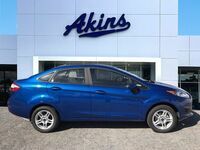 In fact, thanks to its varied lineup of sedan and hatchback trim levels, its wide array of stylish exterior color options, its surprisingly spacious interior, and its comprehensive suite of advanced new safety, technology, comfort and convenience features, the 2018 Fiesta lineup has positioned itself to be the perfect choice for anyone shopping for a new subcompact car or hatchback. 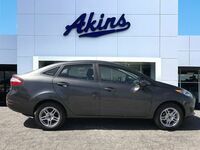 But astute car-shoppers know they need to see the facts and figures before making any car-buying decision. With that in mind, we put together this 2018 Ford Fiesta versus 2018 Honda Fit model comparison to show you exactly why the 2018 Fiesta lineup is the perfect choice for your new car or hatchback. 197 HP & 202 lb-ft. Max Horsepower & Torque Ratings 130 HP & 114 lb-ft.
As you peruse our 2018 Fiesta lineup versus 2018 Fit lineup comparison table above, there’s probably one thing that immediately jumps out at you – and that’s that the 2018 Ford Fiesta lineup has a starting price just under $2,000 less than the starting price of the 2018 Honda Fit lineup. That right there should tickle your wallet’s fancy, but that’s not all that’s great about the new Fiesta lineup when compared to the new Fit lineup. You’ll also notice in the table that the 2018 Ford Fiesta lineup is far more versatile than the 2018 Honda Fit lineup. That’s because the 2018 Fiesta lineup features sedan and hatchback models to go along with a pair of engine choices. The 2018 Fit lineup, on the other hand, is only available as a hatchback and features only one engine option. Rounding out our comparison are the power ratings of those engines. 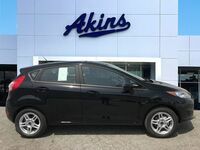 The new Ford Fiesta lineup’s most powerful engine offers 197 horsepower and 202 pound-feet of torque, whereas the new Honda Fit lineup’s engine offers only 130 horsepower and 114 pound-feet of torque. For more on the 2018 Ford Fiesta lineup, please get in touch with our staff here at Akins Ford near Atlanta, GA. Interested in a Ford Fiesta?